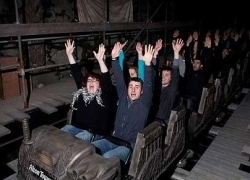 Opening two months later than a launch date that was already later than convention, Thorpe Park had much to prove with Derren Brown’s Ghost Train. The stakes were also high for Brown himself, after lending his name to a theme park ride for the first time. He also agreed to issuing statements claiming that the ride represented the future of theme park attractions. The spin preceding the ride has been approaching that seen in 2010 during the promotion of Alton Towers’ Thirteen rollercoaster. Merlin Entertainments chief executive Nick Varney has also labelled Derren Brown’s Ghost Train as a “game changer”, while the construction cost has been reported as being £13 million. Brown has been vocal – and continues to be in the form of a hologram during a pre-show – in his desire that riders keep the attraction’s contents secret, so that others can enjoy it. Since Thirteen, we at Ride Rater have always encouraged people to resist temptation and not read spoilers before they experience things for themselves. So thanks for visiting, but please bookmark this page and come back after you’ve been to Thorpe Park for yourself! While we are in the business of thorough reviews, it is worth noting that we may actually be incapable of revealing many of the ride’s secrets at this stage. The ride incorporates virtually reality and apparently features 12 possible ‘scenarios’ and two variable endings. Due to the ride’s huge popularity at present, and we rode just the once – so what we describe may well be quite different from what you experience. The ride is housed within a vast building – half brick effect, half wood – adorned with grafitti and partially ripped posters. Dramatic film-score-like music plays loudly – at points too loudly – in the queue line. You pass through an infection-screening booth where your photo is taken. You can buy your photo later by reproducing your ticket, but ours showed a different group of people. As you enter the main building, you watch a pre-show featuring a holographic Brown, who explains how fear and adrenaline work in humans, virtual blackboard and chalk included. Merlin’s trademark odour effect, abundant in Thirteen and its Dungeon attractions, is present as you precede into a large open area which features a full-size Victorian-esque railway carriage seemingly suspended by chains in mid air. We see a preceding group of riders coming off the train, none of them looking particularly terrified or otherwise emotionally affected, even though they have just completed the experience. As we board the train, which turns out to be a modern London Underground-style train housed within a Victorian shell, we are impressed at the realism and resemblance to the real thing. After taking your seat, you place a headset incorporating virtual reality eyepieces and earphones over your head. The sets require a little adjustment to get the right focus on the screen, but this is helped by a technical message which is displayed before anything happens. As the experience begins, everyone around you has has suddenly disappeared. It took us a while to think of turning our heads, but when you look toward each end of the train and see it is completely empty, the effect is somewhat effective in messing with your senses. The train accelerates to the next station, and there is physical movement of the train combined with the visual cues, which is also effective. A ghostly Victorian-style figure boards the train at the next station, sitting in front of you and talking to you about ”gas down here” while his dog barks anxiously. He disappears and a demonic girl then lunges at you – clumsily mistimed with leg touches from the staff that have remained on the train with you. We are soon ushered from the train in a panicky evacuation, being asked to cover our mouths, presumably due to some sort of infection-type back story, or maybe the gas alluded to earlier. We leave the train and realise that we have moved into a convincing replica tube station, the platform from which you are evacuated and ushered into an underground track junction. Staff continue to shout as you pass two stationary train fronts in tunnels, while a third tunnel fills with smoke and produces loud sound effects indicating a rapidly approaching train. Lights of a train move towards you as its horns sound, it almost comes out of the tunnel – of which we are stood in front – and then suddenly disappears, being replaced by monstrous noises which half give the impression of something coming after you. We are then whisked back into the waiting train at the platform, presumably as some sort of escape effort, refitting our headsets after taking our seats. The carriage is attacked by the same monster that accompanied Brown in scare-the-public publicity stunts that preceded the ride’s opening. As the train moves forward within the virtual reality environment, the visuals attempt to show a post-apocalyptic city – presumably London – being attacked and torn down by mutant creatures. Falling debris hits the train and leaves a gaping hole as a creature boards and lunges at you, while a manhole cover lies at your feet. There is a oddly long period of greyness where nothing is visible other than two distant lights. The train rocks and eventually falls from its elevated tracks, into a gaping fissure in the ground below. The rest is a blur and the experience ends suddenly, leaving us to leave the train and be that same group of somewhat emotionally blunted people we saw disembark just a few minutes before. The ride is confusing in its story. While not quite to the extent of the Nemesis Sub-Terra, the ending we experienced was a little anti-climatic. The experience is too reliant on virtual reality technology that is just a little too pixelated and low resolution – the CGI is reminiscent of an average video game. Physical forces of the ride are sadly minimal, but there are numerous moments where you are left trying to work out where you have moved, how the trains have actually travelled and where about in the building you could possibly be. The ride clever, high-tech and laden with effort, but unfortunately it is not terribly scary. Its re-rideability remains to be seen, and possibly the other ending and different scenarios are better. Brown and Varney were right to say that it is unlike anything else that has happened before, but it would be questionable to say that it represents the likely long-term future of thrill-seeker attractions. As far as scaring and exciting people goes, physicality will endure long after virtual reality has faded into a distant memory. If Brown was as heavily involved with the concept as has been claimed, he should admit that while his Ghost Train is a good product, it is hardly the greatest thing he has come up with. 9 Comments on "Review: Derren Brown’s Ghost Train, Thorpe Park"
If your waiting in line reading this review to see if its worth the wait or not, all i can say is dont waste your time. It is the most dissapointing ride in any UK theme park. Please leave the que now and go on a real ride. I’m just trying to save you time so you dont go through the same experience I did. I went on this on Sunday…I get the man talking to you with the dog , just about get the zombie thing ….how did we end up in the 7th circle of hell at the end ??? This is called ghost train ….makes no sense having things that aren’t ghosts running around …bit of a let down !! It will be my first time tomorrow going on the derren brown ride so hoping for the best. From what I’ve read that wasn’t other customers reviews it sounds very terrifying yet so awesome lol :). Can’t wait to try it out. Well we waited in the que for 3 and half hours despite informing itll be a 2 hr wait due to technicalities. When we finaly got on the train the vision was blurry and and not realistic at all, felt like you were watching a very old computer game. Then we were evacuated from the train and after poor acting from staff memebers outside we went on to another train. On this train the vision from the goggles wernt as blury however the sound was not clear or loud enough. However at this point the whole ride broke down and as a result we were stuck in it for 15 minutes withno air con and no real explanation for why we were waiting. After the ride was back on track we were offered to start again as we missed the ending. Obviously after waiting 3 hours in the que we wernt going to leave without seeing the end so we accepted. So we had to wait for other people waiting outside to get on. Once we started the whole thing from the begining the ride broke down on the second train at the same point again. So we were stuck in the train for a further 15 minutes as you can imagine we were fuming. We went in the que at 2 and left the ride at 6! We still did not manage to see the ending and because of this we also missed on other rides which we paid extra for fast track! Obviously we made the guest services aware and managed to get a refund but this did not compensate for such an awful experience and a waste of a whole day! Deffinetely not worth it much improvement needed clearly was not ready for launch! I went on this ride yesterday on the 23rd Saturday 2016. I though it was an amazing ride and experience,walking into a re-invented ghost train hanging in the air,all glowing up in the dark. The staff/actors were really good keeping the story of the ride alive throughout the journey. The VR special effects need more higher quality graphics as it looked like an old games console’s graphics from the old days of gaming. The VR headsets themselves felt tight to place on your head as there was no adjustments making the headsets hard to put on and off. The first VR headset I had blurry vision on the lens from the were it was cleaned and made it harder to see what was happening as on my second train ride the next headset was clearer to watch. The sound on the headset worked ok just it took me a few goes to get them in line with my ears to hear it better. Over all I though it was a great brand new experience and it was good that the train moved while you watch the special effects take place. Thanks for sharing your thoughts David! I tried this out today and, although I can see the potential, sadly the experience wasn’t as good as it should have been. Firstly, after the holographic introduction by Derren you are moved into another staging room where you wait for an eternity. Today was a hot day and being stuck in a sealed room with no airflow makes for a pretty uncomfortable experience. Next, you finally get on the train and try to fit the VR headset. With a bit of trial and error, you finally get it to fit comfortably. The experience then strays pretty much as explained above. What was particularly bad, given the ride has only been open a couple of months, was my headset only had one earpiece working which, given how much time I’d been queuing, didn’t overly get me off to a good start. The VR effects started off ok and I was impressed with some of them. The trouble is that when you are rushed off the train into the tunnel part, the acting by the staff is pretty poor and not very believable. If this ride were in the USA you know you would get better theatrics by the actors. The second part on the train is then fairly good with some nice visual effects. Sadly there are some gaps and to me, the whole experience could easily be made a lot better if it were polished up a bit. I’m glad I tried it but, I certainly wouldn’t queue for hours to see it again. It is definitely the shape of things to come but it needs some much needed improvement. This ride is probably one of the most disappointing experiences I have had at a theme park. The effects were poor, you were rushed and crammed and couldnt even see what was going on in the mid section of the ride…It was simply yawn worthy, nothing more. Spend the queue time on better rides. Very much agree with this, my boyfriend and I luckily only queued for an hour but we chose to do this last and quite frankly it brought a downer on the whole day! Extremely disappointing ride, wish we’d spent the last hour on everything else!